Selection from the progeny of F1 generation after mother plant Agnus and other breeding material. 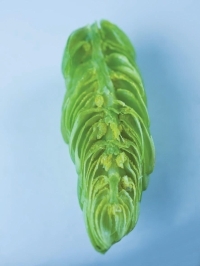 It is the result of hop breeding aimed at pharmaceutical and biomedical purposes. It shows high contents of xanthohumol and DMX which have good effect at human health. Therefore the name Vital "healthly". For more information (Aroma charts, chromatograms, genetic and any other characteristics) use The variety atlas. 4-dekonová kyselina, ME 0,8-1,5 % rel. Odrůda Bohemie byla získána výběrem z potomstva F1 generace matečné aromatické odrůdě Sládek a z rozpracovaného šlechtitelského materiálu, který má v původu Žatecký poloraný červeňák. Odrůda byla registrována v roce 2010. Pivovarské použití: odrůda je vhodná pro druhé chmelení. Aroma je slavě kořenité, chmelové. Veškeré pryskyřice 17-22 % w.
a-hořké látky 5-8 % w.
ß-hořké látky 4-6 % w.
4-dekonová kyselina, ME 0,5-1,0 % rel. Farnesen < 1,0 % rel. KAZBEK - odrůda Kazbek byla získána výběrem z potomstva hybridního materiálu, kde je v původu ruský planý chmel. Robustnost a stabilita jsou zakotveny v názvu odrůdy, protože kazbek je nejvyšší horou středního Kavkazu, a tyto vlastnosti jsou pro ni charakteristické. Aroma hlávek je kořenité - citrónové. Pivovarské použití - Kazbek je aromatická odrůda vhodná pro druhé chmelení nebo případně studené chmelení. Je také zařazována do kategorie odrůd "flavour hops", které jsou charakteristické kořenitou nechmelovou vůní. Veškeré pryskyřice 15-22 % w.
a-hořké látky 3,5-6 % w.
ß-hořké látky 4,0-6,5 % w.
Odrůda Saaz Late byla získána výběrem z potomstva F1 generace po rodičovské kombinaci rozpracovaného šlechtitelského materiálu, který má v původu Žatecký poloraný červeňák. Odrůda je pozdního charakteru. Pivovarské použití: Saaz Late je aromatická odrůda pro druhé a třetí chmelení. Aroma je pravé, jemné chmelové. Total resins 11-14 % w.
Alpha-bitter acids 3-5 % w.
Beta-bitter acids 5-7 % w.
Total resins 20-23 % w.
Alpha-bitter acids 5-7 % w.
Beta-bitter acids 6-9 % w.
Beta-farnesene < 0,1 % rel. Selinenes < 0,1 % rel. Sladek - is characteristic by a high share of beta fraction and high yield potential. The variety was registered in 1994. The current acreage is around 200 ha with a production of 400 - 500 t. This variety was a part of a long trial and was tested together with many aroma varieties (Hal. Tradition, Cascade,.) and always won. Sladek is a foremost variety for the second hopping of lager type beers (with Saaz used for the last hop addition). Some breweries use it also for third hop addition in case of non-premium beers. The origin of Sladek is in Saaz aroma hops and therefore the content of beta acids is high and these make the character of bitterness very fine. Alpha-bitter acids 7-9 % w.
Beta-bitter acids 4-6 % w.
Bor - is currently being substituted in production by Premiant variety which is more stable with regards to alpha contents and yields. Total resins 21-25 % w.
Beta-bitter acids 3-6 % w.
Premiant - is characteristic by a higher alpha content and yield potential. Premiant was registered in 1996. The current acreage is around 200 ha with a production of 400 - 500 t. This variety was a part of a long trial. 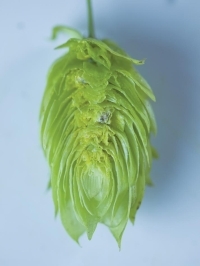 Premiant in its group mostly pushed out other varieties (Perle) and it is used in Czech breweries for the second hop addition. 50 % of its origin is Saaz fine aroma hops and has a low cohumulone content. It has positive effect on fine beer bitterness. According to our experience some breweries prefer to use Sladek and some Premiant - each variety has a unique character. Premiant has a neutral bitterness. Total resins 27-31 % w.
Alpha-bitter acids 12-16 % w.
Agnus - is characteristic by a high beta acids content (alpha/beta ratio is approx. 2,0 while most of other high alpha varieties in the world have this ration around 3,0). In genetic origin of Agnus is variety Sladek (therefore a high beta content) and also other good quality characteristics. Agnus is used by large Czech breweries. The brewing quality is comparable with other varieties (Magnum, Taurus, Columbus, Target) however from the brewing results it has a better effect on beer stability. Therefore this variety is used for export beers. 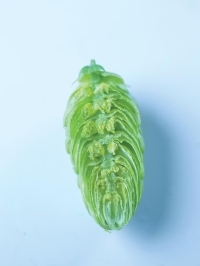 The results of research tests show that this variety is suitable for extraction as well as processing into pellets and so not only for first hop addition but also for second hop addition (high beta acid content). Methyl-4-decenoic acid 1,0-1,8 % rel. Harmonie - is characteristic by a high share of beta fraction but oppose to Sládek it has higher content of alpha bitter acids. The variety was registered in 2004 and therefore the acreage is currently very limited. The first brewing trials and testing in Czech breweries showed at very good quality especially for intensity and quality of beer aroma. Methyl-4-decenoic acid 0,9-1,6 % rel. 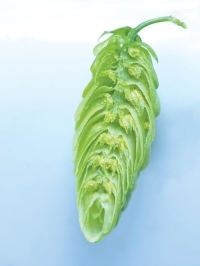 Rubin is a bitter variety but it is genetically similar to old middle European aroma hops. The Saaz variety evidently influenced its genome. It has fine bitterness with longer dying away in comparison to Saaz.